OCASI created and launched Settlement.Org in 1999 and has been responsible for the ongoing development and maintenance of the website ever since. This includes web development, content development and marketing of the site. The project receives federal and provincial funding from Immigration, Refugees and Citizenship Canada (IRCC) and the Ontario Ministry of Citizenship and Immigration and International Trade (MCIIT). A very useful and popular feature of Settlement.Org is the moderated Discussion Forum. Here users can ask questions related to their experience living in Ontario and receive an answer from either our Information and Referral specialists and/or other users of the forum. 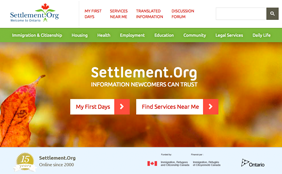 In 2005, Settlement.Org was awarded the Merit and Diamond Award of Excellence by the Government of Ontario, a distinction given to an online service-delivery initiative that is “truly exceptional”.